Oh yeah, I need to do some of that! Looks like you have the cuddling thing down perfectly! Nice work. All three of you in the same bed??? GASP!!! We're all into this Cuddling Day, too! You three look adorable, by the way. so did you nearly faint when you saw this happen? or was the house super cold? YES to both - but she didn't faint until AFTER she grabbed the camera!! How adorable you three are! WE never touch one another here, well...only to whap one another! So cute!! I guess my dog knew about this holiday this morning, I woke up with him cuddled up against me with all the covers on his side! Such sweeties. Happy cuddle day. So sweet! We aren't the cuddling kind, much to Mom's sadness. Oh no! Allie, what are you doing laying against your bro? Hope you don’t catch his cooties. 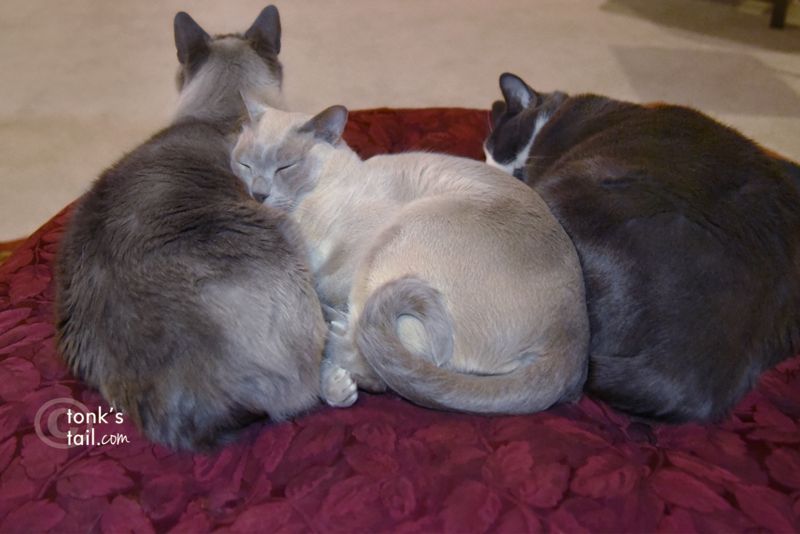 Wow, three cats together is an unusual sight! We haven't cuddled together since we were kittens. You'd never get all three of us doing that. Best photo ever!!! We are in too!!! So that's why Raven hasn't left her bed since we got home from work. She's cuddled up and won't come out and we've been home for 4 hours. You all look cozy together. What a cozy pile of kitties!